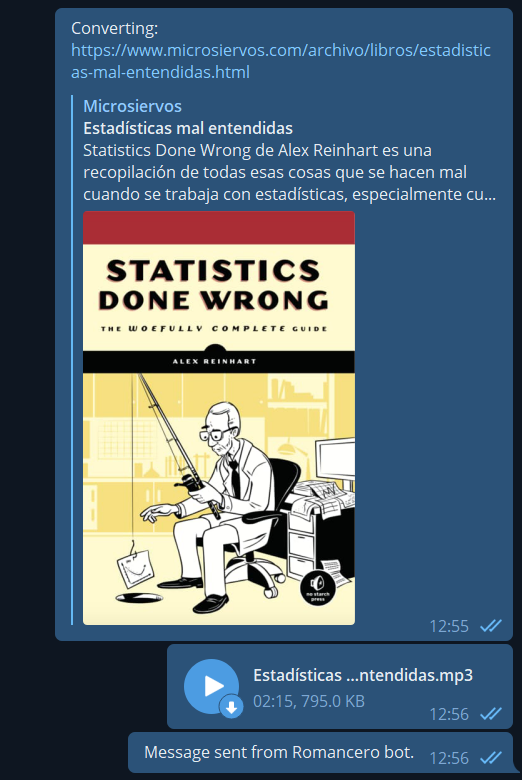 The following Python script extracts the content of an article using Readibility (ported to Python), converts it to voice using the Amazon Polly service and finally sends the audio as a voice note to a given user in Telegram using Telethon (Telegram client for Python). User permissions for creating Polly jobs and accessing/writing files in a S3 bucket. When creating this user, make sure you write down its ID access key and its secret access key. You will need them to configure the aws-cli client. In this step, you will need to fulfill the details with the user credentials you wrote down when creating it. Now, you will need to create a Telegram API ID. For this, you can go to the Telegram section «Create an Application«. After following the steps described in the official documentation, you will obtain an API ID (it’s a number) and a API hash (it’s a string). With these steps already completed, you can place all the needed details in the script and run it.